Here is my outfit from our last night in Corfu. The hotel had an a la carte restaurant right on the front of the beach overlooking the sea and Albania in the distance. The food was lovely and we had a brilliant time! I love your outfit combination. Very simple and chis. I might try for the bag and shoes. Love the print on the skirt! Pairing it with that shirt just looks so comfy! Definetely need to track down a skirt like that here in NZ for when it's summer! Lovely outfit. Love your skirt. 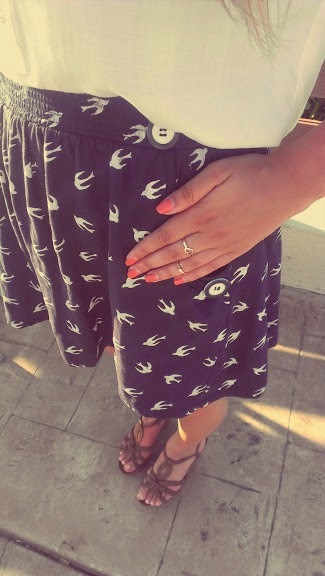 Really cute shorts, and I really love that bag. Cute photos! I love your handbag!